This semester I’m taking a studio with John Ronan from John Ronan Architects. We’re designing a cemetery and chapel for the unclaimed dead of Chicago. 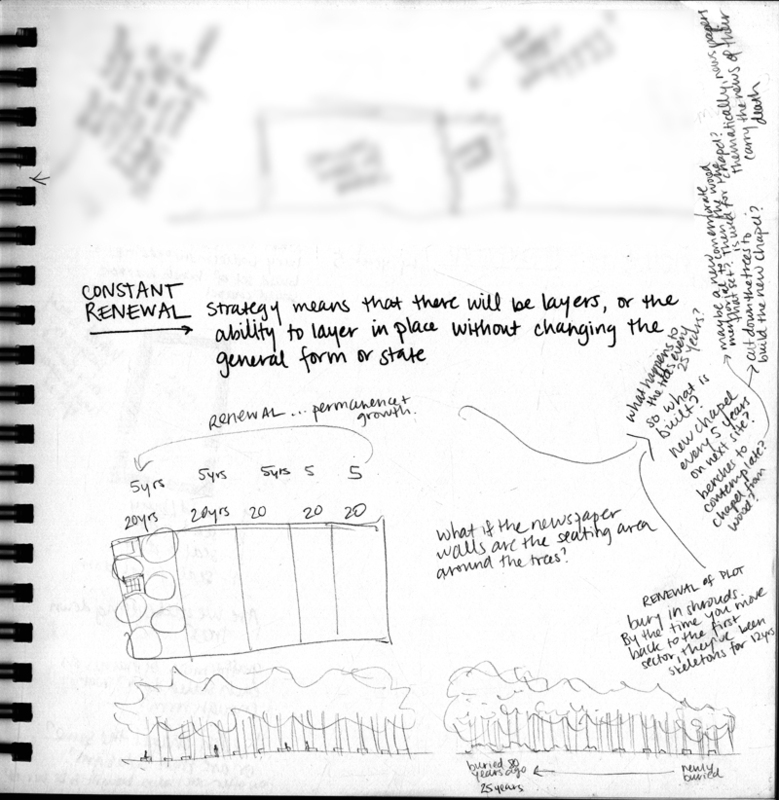 As I was working through some site strategies in the early part of the design process, I realized how much my design process is dependent upon questioning myself. 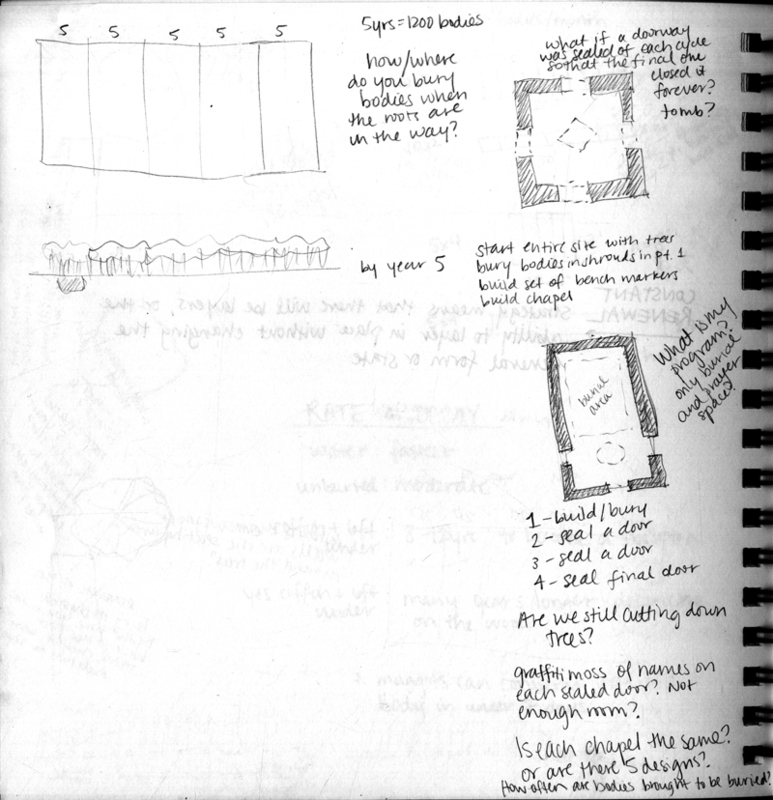 I explore my ideas through drawing perspectives, elevations, plans and sections, and then writing down questions. Through this sequence, you can track how my ideas develop. It also allows me to go back, later in the process, and see if I have addressed all my questions with my new solution. I thought it would be interesting to write out my list of questions from tonight. How do we reclaim and assert the precious value of the unclaimed? What to do with bodies? Do we keep a record of who these people are? how? Who comes here? Where do they go? Why are they here? How does it fill up? is it full at the beginning and additions are unseen? Can you track its process of filling? But then when happens once it’s full? Is cremation/body preparation done on or off site? Are there markers? What are they? What’s on them? Why are the walls built? Where do the bodies go? Constant renewal strategy: means that there will be layers, or the ability to layer in place without changing the general form or state. What if the newspaper walls are the seating area around the trees? So what is built? new chapel every 5 years on next site? benches to contemplate? chapel from wood? What happens to the trees every 25 years? How/where do you bury bodies when the roots are in the way? What if a doorway was sealed off each cycle so that the final one is closed forever? tomb? What is my program? only burial and prayer space? Are we still cutting down trees? Graffiti moss of names on each sealed door? Not enough room? Is each chapel the same? Or are there 5 designs? How often are bodies brought to be buried?